The I Rub My Duckie Red Devil Travel Size, with flowing red cape, mischievous horns and high-powered vibration is perfect to tuck into a pocket or purse for discreet travel. 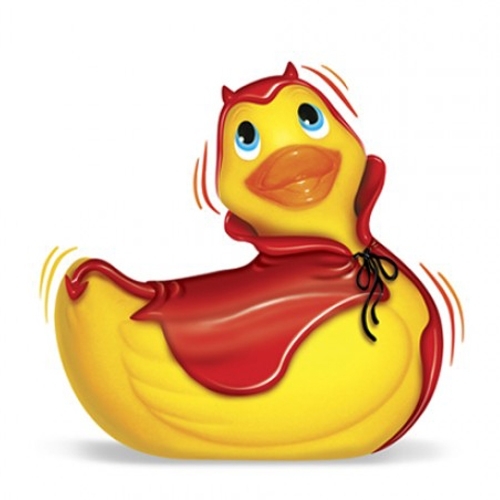 Although the I Rub My Duckie Red Devil Travel Size is only about half the size of the original, it has amazingly pocket rocket like vibrations. Quiet and waterproof for your discreet pleasure. Like all Big Teaze Toys products, Travel-Size I Rub My Duckie Red Devil contains no latex, phthalates, lead or heavy metals. It requires only one AAA battery to make you smile (not included).